When it comes to planning a wedding, brides have so many decisions to make. There’s everything from flowers and food to music, as well as transportation. While transportation may not be the first thing on a brides’ minds, it is a part of the wedding day that requires planning. One popular mode of transport for many brides is a limousine on their wedding day. Here are 3 reasons brides love hiring a limo service. One of the biggest benefits of renting a limousine for your wedding day is to make a bold impression on your guests. As you arrive at your location, you’re guaranteed to have heads turning your way, making you feel like the special bride you are. Let’s face it, wedding days are stressful for most people. A luxury Santa Barbara limo service can take away your transportation worries. In fact, you can sit back and relax as your professional chauffer gets you safely where you need to be. What’s more, a chauffer has inside-out knowledge of the best routes to take to avoid traffic jams to ensure you arrive safely and on time for your big day. 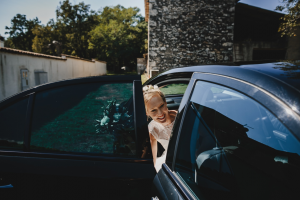 Whether you and your bridesmaids need to get to the service venue, or you and your groom are on your way to your reception, you’re guaranteed stylish and reliable service all the way. Taking candid and intimate photographs of everyone while they’re inside or next to a limo is a magical way to preserve your special day with your nearest and dearest. After all, it’s not every day you get to ride with the people you care about the most on your wedding day, of all days. A limousine is the perfect way to make your special day even more memorable. The memory of riding in a luxury vehicle complete with comfort is sure to stay with you for years to come. With friendly and professional drivers along with champagne and style, it’s little wonder brides love a limo service. Need a limo for your big day? Silk Road Transportation has you covered.